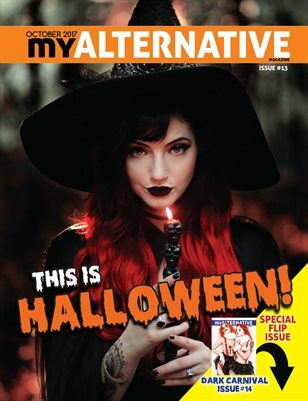 Issue #13 AND Issue #14 of MyAlternative Magazine. This is our Special Combined FLIP October pair of issues, #13 "Halloween" and #14 "Dark Carnival" themed Issues. There are two featured interviews, one in each issue. The first is with Front Cover model and Barber Vanessa Luciano in the Halloween half. The second, and in the Dark Carnival half is with Alternative Models Helena Harpei and Kimberly Renee.